A variety of models adaptable to all applications. 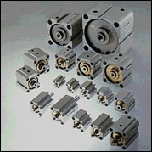 A full series of non-rotating rod cylinders. Easy to maintain disassembling type. Rod end is equipped with female thread(standard).Male thread (semi-standard) types are also available. Non-lubricating. Click the icon as follows, to check the details.